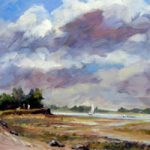 Please mention the Surrey Artists website. 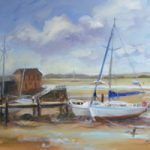 Commissions Invited: If you wish to discuss commissioning a painting, then I am happy to travel (within a 50 mile radius) to meet you (free of charge or obligation) to discuss your ideas before taking this further. Please email me to arrange this. 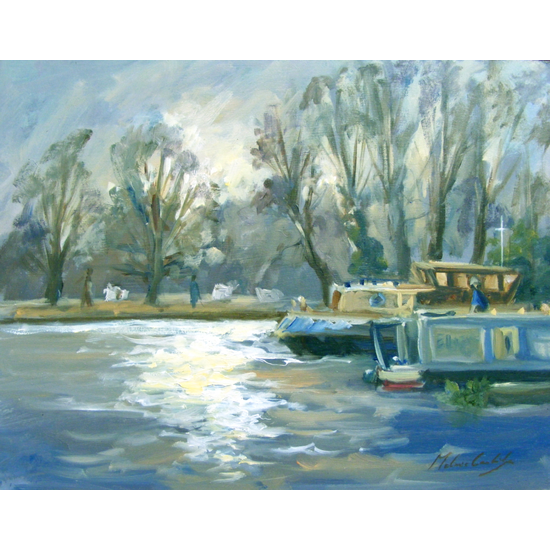 Melanie’s work is based on light and colour. 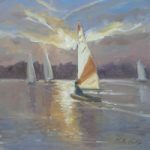 She loves to capture the fleeting effects of light on her subjects, especially where it sparkles on water. In order to do this she paints on location all year around. 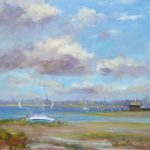 As well as painting views of the River Thames, other favourite locations include the Surrey Downs, the River Wey and the Blackwater Estuary in North Essex. 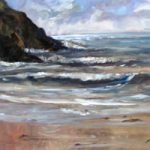 Working mainly in oils, she is available for commissioned work, but specializes in landscapes and coastal views of locations personal to her clients rather than portrait work. 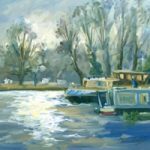 Melanie is an active member of Guildford Art Society, Caterham Art Group and the SAA (Society for All Artists).